A lively introduction to the people and kingdoms of Britain's Dark Ages, with lots of fun facts about everyday life, including the amazing burial ship found at Sutton Hoo, in Suffolk. Useful information about the Anglo-Saxons and Vikings in Britain. See the largest hoard of Anglo-Saxon gold ever found. 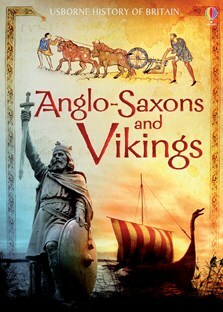 Find out about life in Anglo-Saxon times. See beautifully designed objects made by the Picts and find fun activities about the everyday life of monks. Create your own poem using words that originated with invaders of Britain, and try an artifact-matching game. Follow the events after Edward the Confessor's death in 1066 that lead to the Norman Invasion. A fascinating account of how Britain emerged from the Dark Ages, from bloodshed on the battlefield and kings in crisis, to monks and murder. Full of intriguing facts, illustrations, photographs, detailed reconstructions, paintings, maps and timelines. Includes internet links to websites to find out more, and lists of places to visit throughout Britain.